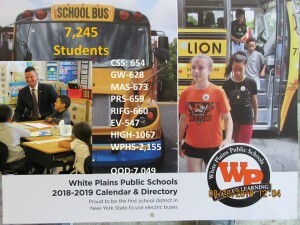 Home→White Plains Schools Video Puts Faces, Voices of Students, Parents, Teachers Together to Explain the Unique Difference White Plains Schools Provide: Support, Attention, Development. ← Remembrance of a Requiem : The White Plains Candlelight Walk September, 2001. White Plains Schools Video Puts Faces, Voices of Students, Parents, Teachers Together to Explain the Unique Difference White Plains Schools Provide: Support, Attention, Development. As the 7,245 students in the White Plains City School District get down to serious business after 9/11, the school district released a 10-minute video last week on social media. It was written and produced by Clerk to the School Board and longtime spokesperson for the school district, Michele Schoenfeld.